This post was originally published on April 22, 2015 and updated on April 2, 2019. Seems the theme of this spring’s outings have been waterfront-related. A few weeks before my trip to Chiemsee, we visited the famous Andechs Abbey, situated between two lakes just about an hour southwest of Munich by car. The abbey is occupied now by Benedictine monks, but it started out about a thousand years ago as a castle for the Andechs-Meranian family. Apparently a certain Count Rosso, progenitor of the that family, brought back pieces of Jesus’ crown of thorns, cross and other artifacts from the Holy Land. Although the original castle and chapel have been destroyed and the church rebuilt a couple of times, the relic treasure resides at the church today. The church and monastery stand on top the high hill known as the Holy Mountain, tended by the Benedictines. 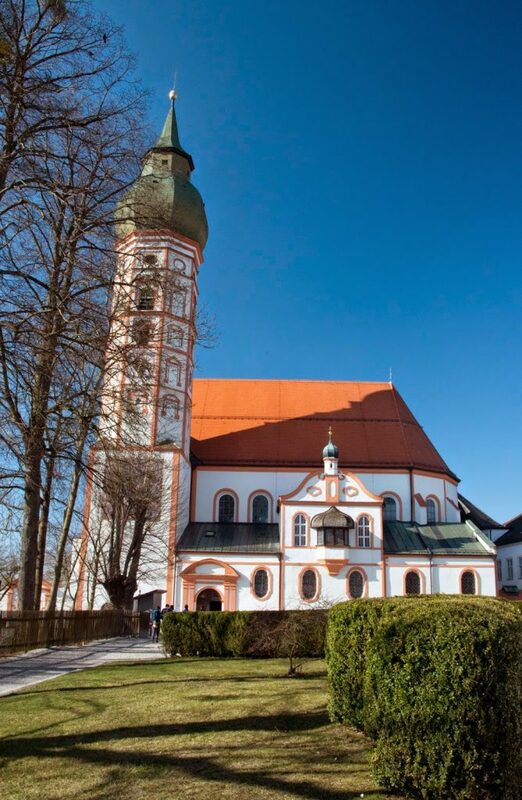 The church is the oldest pilgrimage destination in Bavaria, which means devotees make an annual pilgrimage through the countryside on foot here on a certain date each year. The Holy Mountain lies between two lakes, Ammersee and Starnbergersee. It was in the Starnbergersee that King Ludwig II was drowned – he was the one who built Herrenchiemsee that I blogged about last week. My husband and I have had the famous Andechser beer in Munich on a few occasions, and we’d been wanting to visit the monastery for some time now. The traveling options were threefold: bus tour, driving by car, or a trip by public transport train to a station about three kilometers (almost two miles) from which we’d have to hike a trail uphill to the monastery. The bus tour didn’t appeal and driving was iffy because, well, beer. We were mentally preparing ourselves for that three-kilometer hike, but then we mentioned the trip to our good friends Christiane and Dean. You’ll remember Christiane as the one who taught me how to make Spätzle. 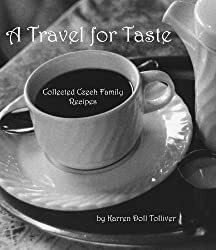 To our delight, Christiane offered to drive, so we all set out on a road trip one Saturday. The advantage of having a local show you around is that you get to see places you don’t know about. Since Christiane is from the area, she took us to the little town of Dießen on the Ammersee before we visited Andechs. Her family used to visit there every summer when she was a child. First stop was this extraordinarily beautiful church, Marienmünster, a baroque marvel dating from the 1700s. You could see Andechs on the Holy Mountain across the water from here. Although we were temped to spend all day in Dießen, we tore ourselves away and drove to the abbey. It was quite the tourist area, with a large parking lot with bus parking. We walked the short distance uphill from the car, passing the requisite beer garden and other curiosities on the way. That tall Australian in the gray hat is Dean. Notice our view! Andechs Abbey was much smaller than Marienmünster, but possibly more ornate. There was a choir practicing in the loft. This was Palm Sunday weekend, so all the holy things were draped in purple in observance of Lent. I think we made the right choice! After perusing the Holy Mountain, it was time to be on our way. Again, Christiane came through with her local knowledge and took us to another little lakeside village called Herrsching. Since we still had some of that beautiful sunshine left, we strolled the waterside and sat in the golden light for a while, watching the people enjoy the nice weather. There was a little castle there which you could rent for parties or weddings, I think. …while the guys toughed it out by the water to finish their drinks before joining us. After dinner we had to make our way back home, tired but happy. It was a great outing on a wonderful day with good friends. It just doesn’t get any better than that!